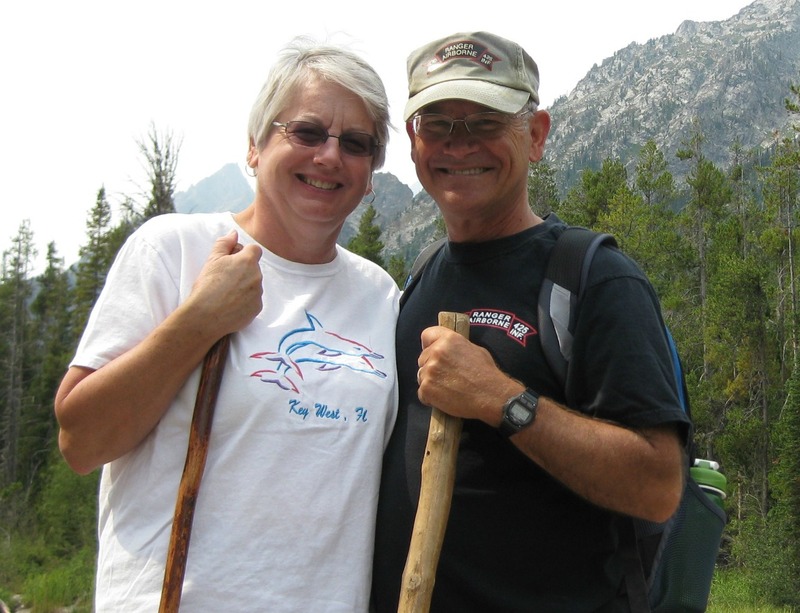 When my wife, Pat, and I first started our journey as fulltime RVers. Pat expressed her concerns about driving in the mountains with a rig as big as ours (38 foot fifth wheel). We had driven through the Smoky and Appalachian Mountains, but our experience with mountains like we would find in the West was limited, and we had never driven in mountains at all with our new rig. We spent out first year traveling in the East and, although some of the mountains in eastern Pennsylvania gave us some concern, we had no real problems there. 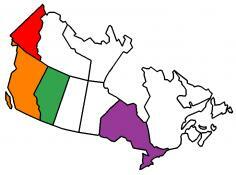 In our second year we decided to head West and we knew we would be getting into the unknown. It is always better to admit you don’t know as much as you would like, and search out the answers, so we began our research. Our first concern was Yellowstone National Park. We knew, from a previous trip, that traveling there would include some very steep grades and switchbacks on mountain highways. We began by posting our concerns on some RV forums and got a lot of good feedback. One of the best suggestions was to purchase the Mountain Directory. This became our bible for trip planning. 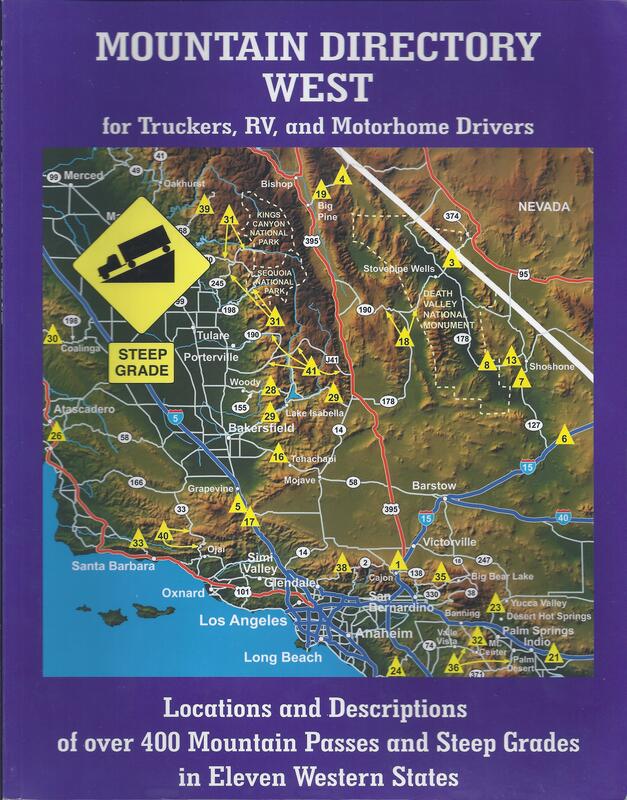 This directory is broken down by state, lists the major routes, and descriptions of mountain passes, both east and westbound. 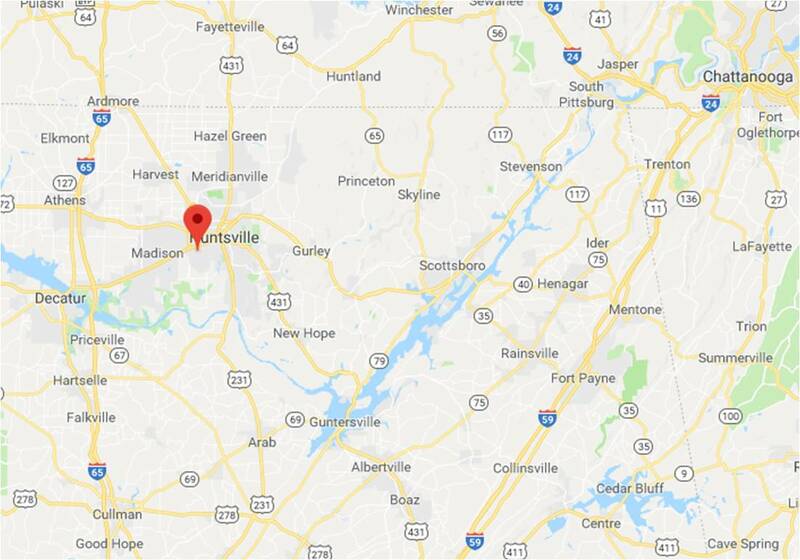 It describes the percentage of the grade and how long the grade is, the miles per hour for curves, as well as warning signs and location of runaway truck ramps. The value of the directory became apparent when we ran directions to Yellowstone on Google Maps and then looked up the route in the directory. The description we read for part of the route said, “At this point the descent begins on what the locals refer to as ‘Oh, My God Hill. '” After reading that we searched for an alternate route. Any survival instructor will tell you the first thing you want to do is to avoid an obviously dangerous situation. By using Google Maps and the directory in combination, we were able to find alternative routes that would place us on the least dangerous route. In our Yellowstone example, the most direct route would have brought us in the North Entrance, but the easier route came in from the south. This caused us to change our plans to visit the Grand Tetons and then Yellowstone, instead of the reverse. 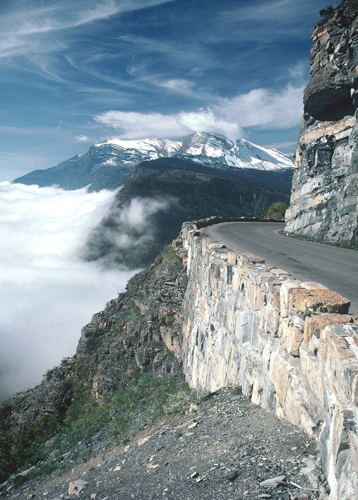 In my opinion the most important factor in driving in the mountains is proper route selection. In 2011, we spent some time visiting the Ohiopyle State Park in Pennsylvania. The hills in the area have some very steep grades and you could smell the hot brakes on the cars that had been braking all the way downhill. This is a great recipe for disaster due to brake failure. During a descent you want to let the engine slow your vehicle, not your brakes. This can be done in a number of ways. First, you can shift your vehicle into a lower gear. Even automatic transmissions will allow you to manually downshift. As the speed increases the engine RPM will slow the vehicle to the speed for that gear. The problem is excessive RPM for too long could damage your engine and/or transmission. Second, you can use your cruise control. As the speed of the vehicle increases beyond what you have set the speed at, the engine will drop to a lower gear ratio to slow the engine. The benefit is that the engine will not run at an excessive RPM for too long. The downside is the cruise setting may not be enough to slow the vehicle to a safe speed. Third, the exhaust brake. This is what truckers call the “Jake Brake.” Most passenger cars will not have this, but most if not all, large pickup trucks and motor coaches will have it. My first piece of advice is to read your vehicle’s owner’s manual! I know, most of us don’t; but this is one case where it is a MUST! We own a 2011 GMC Sierra 3500 pickup truck and, while your vehicle may be different, most are similar to what I will describe here. When we are towing our trailer, we set the transmission in the “trailering mode.” This adjusts the engine RPM to compensate for the weight and friction of the trailer, and provides for better engine efficiency and fuel economy. When, in the “trailering mode,” I set the cruise control, the transmission will automatically adjust the gear ratio, slowing the vehicle when we are descending. This will generally do what needs to be done on gentle grades. If the grade is steep and/or long, I will press the button to set the exhaust brake. The exhaust brake will automatically adjust the gear ratio to slow the vehicle during the descent. The added benefit is that if I feel we are traveling faster than I am comfortable with, I just have to push on the brake pedal, hold for a short of time, and the gear ratio will readjust to slow the vehicle even more. Once I have done this I can even speed up a bit if the grade gets more shallow for a period and the truck will slow down again to the same gear ratio after I let up on the accelerator. I am not a professional commercial truck driver and I don’t pretend to be. I know I descend slower than many drivers would prefer and I ALWAYS descend at or below the posted speed limit. I feel it is better for me to be a little slow and safer than to roll my 50 foot combined length of truck and trailer and cause an accident. Preventive maintenance is a MUST! I always check my tire pressure and lug nuts before driving, under-inflated tires lead to blow outs and rollovers. Don’t drive faster than your tires are rated for. Too many RVers are traveling at 70 MPH on tires that are rated for no faster than 65 MPH. Brakes should be inspected and wheel bearings should be inspected and repacked at least annually. Last year I discovered that one of the seals had ruptured on one of the trailer wheels and the brake linings were coated in grease. It was much better to find this out in the shop, than while descending an 8% grade! If you are not towing a fifth wheel trailer, sway control bars should be used and have the appropriate pressure set. You should be using a weight distribution hitch to keep your truck and trailer in proper vertical alignment. Make sure your trailer brake controller is set for the appropriate pressure, you have good electrical contact between the truck and trailer, and all brake/directional lights are functioning properly. 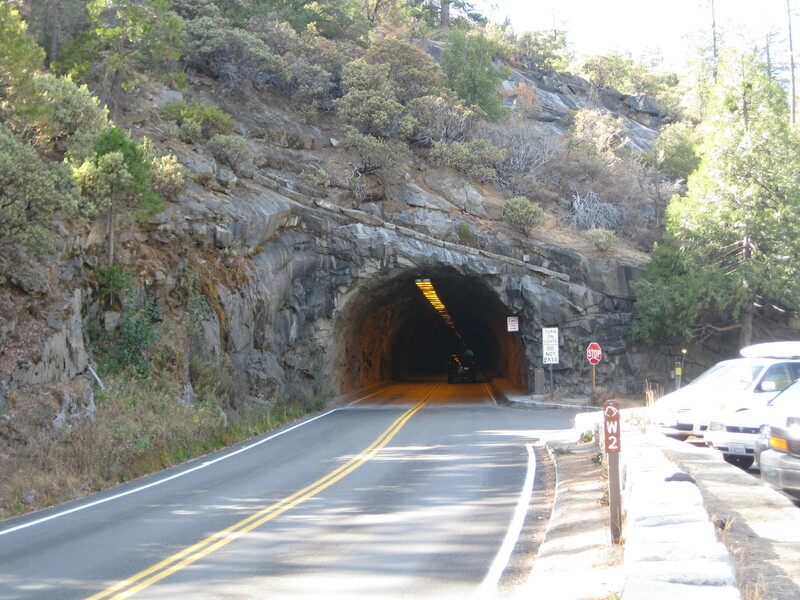 Driving in mountains often includes driving through tunnels. Do you know your overhead clearance? Your paperwork from your manufacturer will tell you the maximum height of your trailer, but that may not be the maximum height when you are hitched to your tow vehicle. Hitch your trailer to your tow vehicle, climb on top with a long pole and a level. Extend the pole from the highest point on the trailer with a string on the end and use the level to insure the end with the string is the same height as the top of the trailer. Then have the person on the ground mark the end of the string, that will give you the exact height of your trailer while on the road. We discovered that one route into Custer State Park in South Dakota had tunnels that were neither tall enough or wide enough for our rig. Good route planning allowed us to avoid an unpleasant situation. Standard overhead clearance on all U.S. highways in rural areas is sixteen feet and in urban areas it is fourteen feet. Trusses and highway signs must be seventeen feet above the roadway. 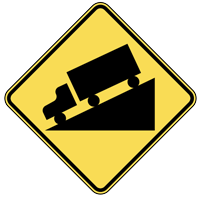 If overhead clearance is less than this, it will be marked with the lesser height. Width is also a factor and that should be measured as well. I found that if my extended mirrors will fit, everything else will too, but you should know the measured width before you get on the road. Weight and, more importantly, weight distribution is important. If you haven’t weighed your rig you should do so soon. 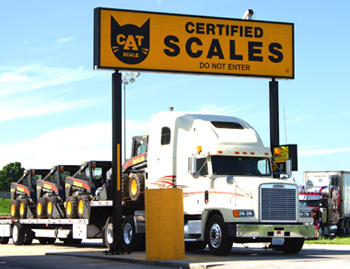 CAT Scales are available in many truck stops and you can find the one closest to you by going to the CAT Scale Locator. The charge is generally around $10 and worth the expense. You will need to weigh your tow vehicle separately from your trailer. The weight of your trailer should not exceed to total Gross Vehicle Weight Rating (GVWR). The weight of the rear axle of your tow vehicle with the trailer attached should not exceed to Gross Axle Weight Rating (GAWR) of the rear axle of your tow vehicle. If your trailer is too heavy, you need to shed some weight by getting rid of stuff and/or moving stuff from your trailer to your tow vehicle. If your rear axle weight is too high, you need to shift stuff to the rear of the trailer, get rid of some stuff, or . . . buy a bigger truck. A good recommendation is to have a 3 X 5 card in the cab of your tow vehicle with all of your critical measurements so you don’t have to trust your memory. 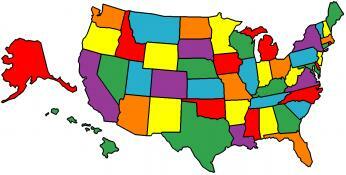 We have traveled through the mountains of Wyoming, Montana, Utah, Arizona, Nevada, and California. I don’t claim to be an expert, but I now have a few thousand miles under my belt of driving through mountains. I hope you find this article to be beneficial to you. This entry was posted in Driving in Mountains, Fulltime RV, Michigan Traveler and tagged driving in mountains, fifth wheel trailer, full-time RV, fulltime RV, Mountain Driving, RV Forums. Bookmark the permalink. Hey thanks for the post. You have a lot of good info especially for the new RVer. You’re welcome! We did a LOT of research when we were starting out and I just wanted to share some of the good information we have acquired over the last few years. Click on the Follow Us link to keep up to date on our posts.